Length Info: Our first "Latin" show begins at 9:50am and is 65 minutes, concluding at 10:55am. There is a 20 minute intermission, when some schools leave, and others arrive (just for the 2nd performance). Our second "Spanish" show begins at 11:15am and is 65 minutes, concluding at 12:20pm. Each show is a separate Arts Integration experience. Spring 2015: TBA Please call 800.435.8687 for Spring 2015 tour schedule. Program Learning Objective: Hispanic Flamenco Ballet's mission is to open the window of cultural expression and understanding amongst the youth of America, regardless of their background, through a variety of traditional Latin American & Spanish dance and music productions, with a goal to offer economically disadvantaged K-12 student’s admission to the same. Students will identify and discuss how norms and values vary across cultures; explain how a civilization/nation's arts, architecture, music and literature reflect its culture and history; and evaluate the cultural contributions of a variety of past and present civilizations. Students will understand music and dance in relation to history and culture. Program Description (Grade Level Program): Our Latin program is specifically designed, choreographed and produced for K-12 audiences, with aspects of the performance highlighting targeted educational standards and core curriculums. Students will witness a dazzling display of traditional and contemporary dance, costume, and music from Hispanic nations of the Caribbean, Central and South America. They will be treated to the sights, sounds and styles of: Argentina, Brazil, Colombia, Venezuela, Mexico, Cuba, Puerto Rico, the Dominican Republic, and many more! 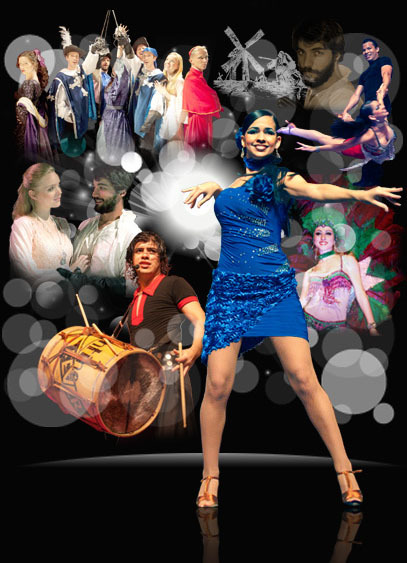 This performance provides students with a unique opportunity to not only observe and understand the distinctions between dances, but it also provides a comprehensive survey of Latin American cultures as seen through the performing arts. 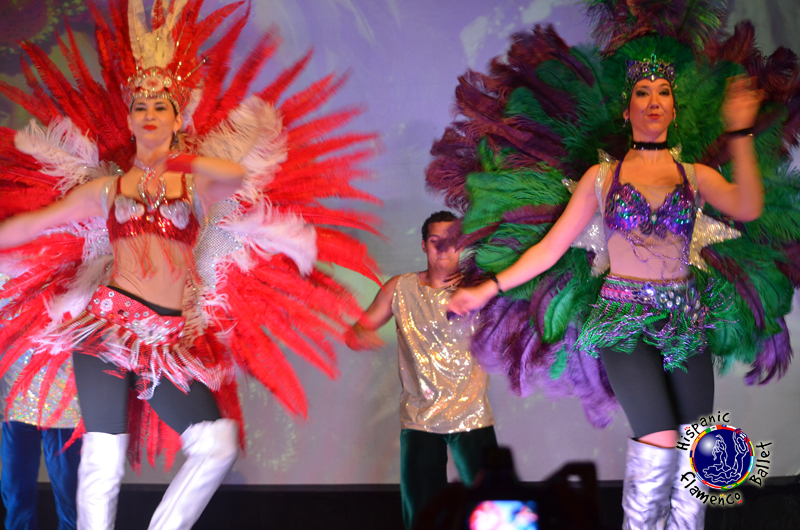 In addition to the live music and dance extravaganza, the showcase features Argentinean Boleadoras and an interactive grand finale when the students perform movement elements and dance skills. The comprehension of the students learning and understanding our cultural education show will be reflected in their ability to participate in the performances through repetition of music, foreign language, and dances from different cultures and historic periods. The students will empathize with our professional performers costume and folkloric music and dance, as they learn to interpret and recognize the patterns in culture and make connections between music and dance as the foundation for modern languages. Our Latin show study guide should be administered through the educators of the younger students. Educators may use the study guide as a base for their lesson plans. For the older student, the study guide in their own hands, will highlight social studies, humanities, world history and the artistic connections of the Caribbean, Central and South American countries through folkloric music, dance and costume. Grade 2: Social Studies: One's town to expand knowledge of geography, history, human interdependence, etc. Include comparisons with another town or city in Connecticut. Standard 1: Content Knowledge, Knowledge of concepts, themes, and information from history and social studies is necessary to promote understanding of our nation and our world. Strand 1.13 - The characteristics of and interactions among cultures, social systems and institutions. GLE # 23: Identify and discuss how norms and values vary across cultures. K-12 Content Standards: Dance: Meaning: Students will understand how dance creates and communicates meaning. Healthful Living: Students will make connections between dance and healthful living. Connections: Students will make connections between music and dance, other disciplines and daily life. History and Cultures: Students will understand music and dance in relation to history and culture. Grade 6:Social Studies: Content Suggestion: World Region Studies of up to four countries or regions from different continents considering the geography, two selected periods of history, and contemporary cultures of these countries: Strand 1.3 - Significant events and themes in world history/international studies: GLE # 5: Explain how a civilization/nation's arts, architecture, music and literature reflect its culture and history. Grade 7: Social Studies: Content Suggestion: World Regional Studies of three or four countries or regions from different continents considering the geography, two selected periods of history, and contemporary cultures of these countries: Strand 1.3 - Significant events and themes in world history/international studies: GLE # 7: Evaluate the cultural contributions of a variety of past and present civilizations.